After a sleepy week, Comet ISON is suddenly coming alive. Several amateur astronomers and at least one professional astronomers are reporting today that the comet has brightened at least a full magnitude overnight. Two days ago it glowed at around magnitude 7.5 and was visible weakly in 10×50 binoculars from a dark sky. Now it’s surged to around magnitude 5.5 – just above the naked eye limit – and continues to brighten. Several amateur astronomers have even seen it without optical aid. ISON’s appearance has radically changed too. 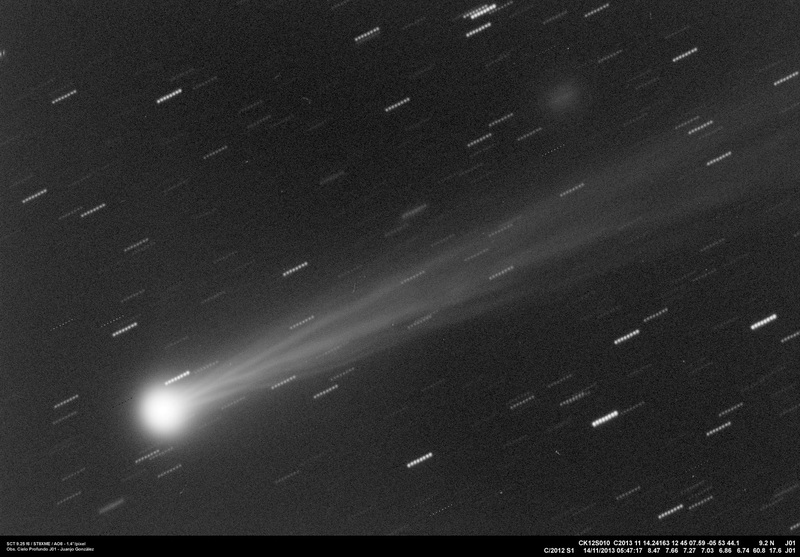 A week ago the comet developed a second gas or ion tail streaming alongside the wider, brighter dust tail. That new appendage has since grown like Pinocchio’s nose to nearly equal the length of the dust tail. I spotted it with averted vision Tuesday morning Nov. 12 through a 15-inch (37 cm) telescope. More exciting, the ISON’s head has been much brighter and more compact. Astronomers rate a comet’s degree of condensation or “DC” on a scale of 0 to 9 from extremely diffuse with no brightening in the center to disk-like or stellar. 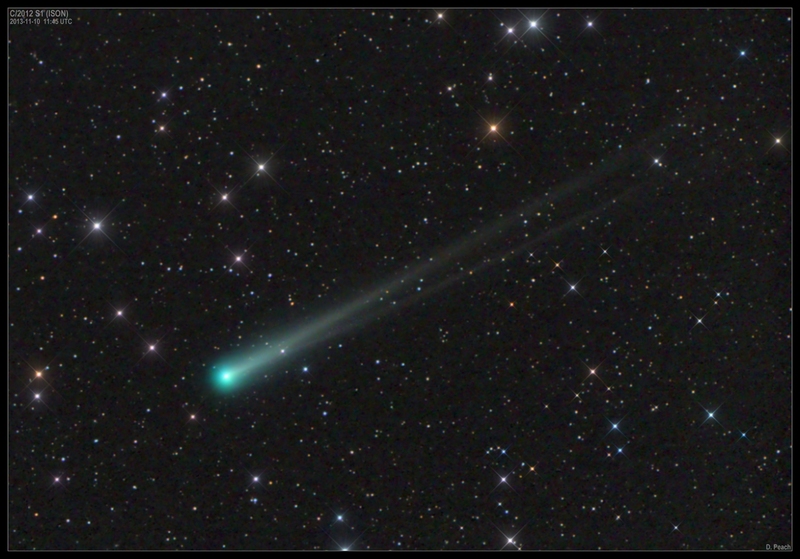 In recent days, Comet ISON has been packing it in at DC=6 or moderately compact and bright. Now amateurs are reporting that the comet’s head has brightened and become much more compact with a DC of 8. Backing up reports of the outburst, astronomer Emmanuel Jehin of the TRAPPIST (TRAnsiting Planets and PlanetesImals Small Telescope) team, noted a tenfold increase in dust production around the comet’s nucleus on Nov. 11 and 12 plus additional jets of material blasting into the coma. Jehin reports that the inner coma near the nucleus is still very sharp and shows no sign of disruption – so far, ISON’s hanging in there. This is all great news for comet observers. The intense heat of the sun is beginning to boil away the comet’s ice with greater fury. The heat may also be exposing new cracks or breaks in ISON’s crust. Fresh ice means even more material becomes available for the sun to vaporize and likely additional jumps in brightness in the next day or two. We just happened to look at it this morning before work at 5am and in the 9 x 63 binioculars the head appeared about twice the size of the day before. It is still quite faint and diffuse, and the tail was at the limit of detectablity with the binocs. Nice job, Rob! Gonna try tomorrow morning. Could be last cloudless until Monday. Rob – super shots, Thanks for sharing. But why do you still thinkmthat the comet is made of ice? I know it’s the received wisdom, and it’s not esy to make a radical change to one’s concepts after you have been involved for such a long time, but the latest evidence clerly shows that there is an asteroid like rock at the ‘heart’ of the comet. The increased brightness is more likely a function of plsma energy level than ‘melting of ice’. I don’t expect you to change horses in mid stream but it would be great if you could just consider the possible electrical alternative explanation for the comet’s characteristics. Thanks again! Dai. Well alrighty then! Let the comet party begin! Thanks for the finder chart Bob…. that baby’s moving FAST! Bruce Gary has the best info. that is amazingly stellar. so are we in trouble here? Is this going to smash into our moon or something? No we’ll be fine, it’s not coming anywhere near us. It will be whipping around the sun soon though, so we’ll lose it for a bit. I saw it at sunset this evening and didn’t know it was ISON at first, but thought it was a really fat, bright contrail. I saw it without even binocs! Thrilling. Then I watched it for awhile thru my Bushnell mini-binocs. Wow. How often in your life do you get to see a comet with the ‘naked eye’? I could even see two tails! there are no comets visible at sunset so u must have been looking at something else. in what part of the sky were u looking? At sunset ISON is below the horizon. Can someone tell me why they think Ison will make a U turn around the sun and not fly straight ahead? Then what will release it after it makes the turn? As this orbital simulator demonstrates (hint: move the “Eccentricity” bar to the far right), any object in an eliptical orbit around the Sun will accelerate as it approaches the perihelion (closest point) in its orbit and, therefore, gain kinetic energy; it is this energy that throws the object back to whence it came. If the kinetic energy of the object is sufficiently high, it will be thrown out of the Solar System; if its energy is insufficient to escape the Sun’s gravity well, it will be pulled back to continue its elliptical orbit around the Sun. Can you judge the approximate amount of material being ejected from both tails? Sorry, is there difference between 2 tails we see today with a good telescope, and 1 big tail people saw in the past with a poorer telescope ?